Lake Khovsgol (Khovsgol Nuur, also spelled 'Lake Hovsgol') is a huge freshwater lake in Mongolia holding 2% of the world's fresh water, surrounded by craggy peaks and rolling green hills. 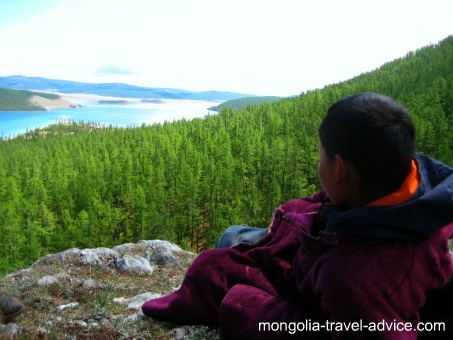 Khovsgol is often said to be Mongolia's most scenic destination. A stunning new panorama greets you at the top of every rise, you feel you could point your camera in any direction and take a prize-winning photograph. Heading through the endless pine trees and into the open valleys dotted with spring flowers and grazing herds, you'll be wondering if you haven't set foot back in 19th century Montana. 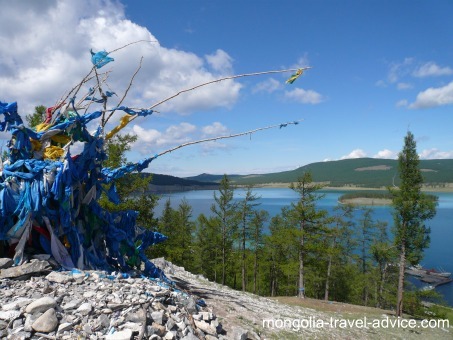 Lake Khovsgol is touristy by Mongolian standards, but this ensures good facilities and equipment are available, and once you get a day's travel from the main town you'll likely have the place all to yourself. The lake starts at the town of Khatgal in the South, and stretches 136km north right up near the Russian border. It is about 40km across (i.e. 80x18 miles) at its widest point. Khovsgol narrows out near Khatgal as it drains into Egiin Gol, which eventually meets the Selenge river and flows into Lake Baikal, Russia. Egiin Gol is more a creek than a river, but if there's been a lot of rain up North into the lake's watershed then the Egiin will quickly start overflowing onto the rocky river flats stretching South of Khatgal. This once happened when I was busily fishing along the Egiin's shoreline: the snaking waters cut behind me, quickly stranding me. I had to head through freezing, thigh-deep water to get back to a safe elevation. Roads stretch up on both the East and the West sides of Lake Khovsgol, but after 30km (14mi) or so they peter out into little more than bumpy, muddy trails more suited to horses or hiking. Remember to factor in the greater distances traveling by road than along the shoreline (i.e. while the lake is 136km long, it's likely to be 200km to get to the top by road). The West (left!) road is more scenic if you're going on a driving trip, but the East (right!) road is the shortest way to the outpost of Khank and the remote border crossing into Russia. The West side of the Lake is more wooded, and contains the higher mountains. The first 10km along the shoreline is lined regularly by ger camps (full of Mongols having a 'beach' holiday in July) while the road wraps behind the sorrounding hills before rejoining the lake after 20km. After the town of Toilogt (about 15km along the shoreline, 30km by road) the road turns to a trail and the shoreline of Khovsgol gets a lot more scenic and wild. From there the trail heads north right up to the top of the lake. About half way up Lake Hovsgol you could then take another trail West and make the remote mountain crossing towards Tsaagan Nuur (home of the reindeer people). Allow at least 12 days to ride there and back from Khatgal, it will be an unforgettable experience. Failing that, there is a very rough jeep trail from Khatgal to Tsaagan Nuur. Beautiful meadow off the Eastern shore of Lake Khovsgol, filled with wildflowers and grazing horses. You'd almost expect a herd of wild buffalo to come rumbling through, pursued by Kevin Costner. The East side gets a bad write-up in the Lonely Planet because they consider the scenery along the road more bland, and there is less wildlife. Plus the road itself gets extremely rough, so there's no point taking vehicles unless you're in a hurry to get a long way north towards the border. Thankfully, this bad press ensures it is less touristed, and I can assure you that if you strike out from the road after half a day from Khatgal, you'll find countryside as pretty as anywhere in Mongolia. 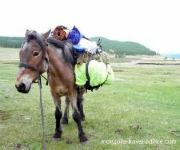 Many of the photos on this page and my Mongolia Horse Treks page are taken from the East side of Lake Khovsgol; I'd highly recommend heading there -especially if you don't have the time/transport to get up north of Toilogt on the West side of Hovsgol. Bolnain hot springs are 3 day's horse ride from Khatgal -perfect for soothing sore bodies, and a good destination to aim for on a medium-length ride. To head off on the East side, you need to back-track South a mile or so from Hatgal in order to cross the bridge over the Egiin; from there you can head back up North along the opposite shore. Me, with my set of wheels, looking down over the valley of Bolmain Springs. Khatgal sits on the shore of Lake Khovsgol at over 1600m (1mi) above sea level. And the surrounding mountains peak at 2000m above that. The Lake freezes so thick in winter that locals drive tanker trucks across it to get to Russia; it spends more time as a roadway than a waterway! This elevation means that ice remains on Khovsgol well into June, and even at the beginning of July there can be brief snow falls at Hatgal. Summer days are usually warm and sunny, but cold storms can blow in quickly and the nights -even into July- can get well below freezing. This makes Lake Khovsgol swimming a pursuit of the brave, and you might find yourself changing layers of clothing several times a day. Do consider all this when planning your trip. I had an inadequate sleeping bag when on my first camping trip one June, and despite bundling all my clothes on I would stay awake freezing each morning between 3am and 5am. Ships at Khatgal surrounded by ice. Early June. Also spelled Hatgal, most visitors to Lake Hovsgol start here. It's a small, remote, spread-out town with gravel streets. Yaks and horses will wander across the main drag in a pleasing, frontier-like fashion, and there was no electricity to speak of when I last visited. Khatgal is lined with mostly wooden huts (timber is plentiful in this region, so even nomads will have a wood structure as their main residence, and take a yurt if they need to move with the grazing herds during summer). It's pretty difficult to get lost in a town this small. The road up from Moron winds its way up along the Egiin river to the main drag, which runs right up through town. As you come into town there is Bata's ger camp close to the town entrance. The place has a hot water system (a big plus after camping!) Bata can arrange horse treks and provide tents, maps, and plenty of advice to you. The camp can be full one night, then empty the next as people head out riding. The whole town can seem lonely and wind-swept on days like these -but gets busiest in July/ August. Across from the ger camp is a small hut of the park office, which gives out fishing permits. Head North up the road a hundred metres and you'll see a couple of basic restaurants and, imporantly, the town store. Here you can buy preserved food, basic vegetables, fishing gear, woolen clothes (if you've under-estimated the cold! ); plus the obligatory vodka and cigarrettes. In short, everything you need to head out in the wilderness! The main road then joins the lake as it widens from the Elgiin. There's another tourist camp up this side of town, difficult to miss. If you see any stalls or houses offering smoked Khovsgol fish out the front, try some! Despite initial impressions, they fetch a high price in Russia and taste fantastic -especially if you've been living on mutton for the past few weeks. Along with fish, I'd recommend buying some root vegetables and stock flavouring: just peel and cut them, add stock and water, and you have a hearty stew to warm you up on those cold nights out camping. See my what to pack page before you go. Also consider if you'll need a cooking pot and a vessel to carry water in; water is plentiful in the region but if there's a few of you it can be time-consuming to constantly walk down and re- fill empty water bottles at the nearest water source. Note that the Sunrise to Sunset international marathon takes place during the first week of August. Over a hundred runners come from all over the world, and go through Khatgal to reach Toilogt. If you can be sure of accommodation (or have a tent!) and are feeling sociable, then this could be a great time to visit. But if it's solitude and serenity you're after, then you best come at another time. View down over Khatgal from the North West. Note how Lake Khovsgol narrows as it drains into the Egiin Gol. Sturgeon, greyling, and a few other fish i couldn't identify fill Lake Khovsgol. The Elgiin south of town offers great fishing within walking distance. Upstream of the bridge there are some deep waters and eddies as the river grinds along a rocky hillside, and from the bridge you should be able to spot a number of fish nosing into the shallow current. You can buy a simple hand-line and lure/spinner from the store, but ensure you use very light tackle or the fish won't come anywhere near you. The local kids use long rigid fishing poles with 3m of light line and a fly on the end, simply flicking it up and down along the creek water, which brings pretty quick results (much better than i could manage, anyway!). Ask around town for a fishing pole and you should find something without too much trouble. If you're serious enough to have packed away your own 3-piece fly pole, even better. Heading up Lake Khovsgol, piers or rocky outcrops stretching into the water offer the best pickings. A bare shoreline on a windy day will not get you much. 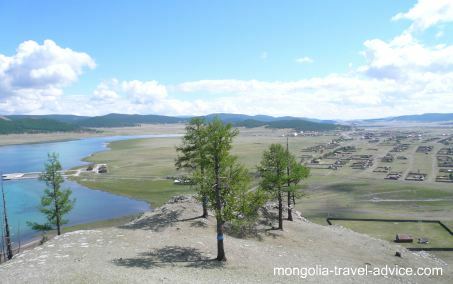 Hovsgol is a the best destination for open water kayaking in Mongolia. Decent kayaks are available for rent in the town. 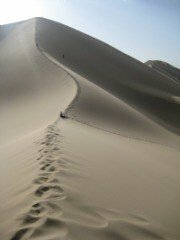 You could do a long trip right up the shoreline if trekking or horse-riding doesn't appeal to you. But be aware: Lake Khovsgol's so big it can quickly get white-capped wavelets if the winds blow in, so don't venture too far from shore if you're inexperienced, and be prepared for the odd splash. I didn't investigate it at the time, but a fun trip might be to float a few miles down Elgiin Gol and arrange for somebody to drive down and pick you up later in the day. Ask one of the locals if they think it's navigable enough for a trip, but I know the first mile or so certainly is. 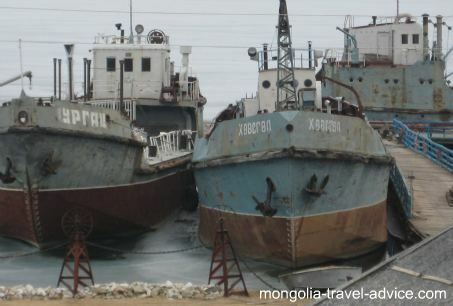 If you want to tour Lake Hovsgol, there are a couple of options depending your budget. For those who want to do a Lake Hovsgol tour in a reasonable level of comfort, with all food, gear and logistics taken care of, then Hovd Tour organize a couple of very good value trips to the lake. 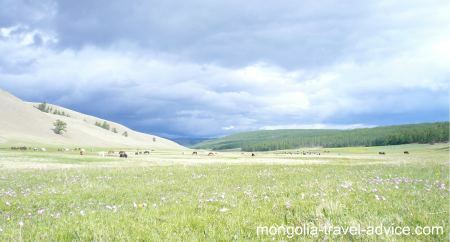 One standard trip does the full 'loop' down through the Gobi desert and up through Central Mongolia to Lake Khovsgol. Another more adventurous tour involves a 10-day horse ride up the Western shore of the lake and in to see the Tsataan (reindeer people) across the mountain range -which would be a fantastic and unforgettable adventure. Otherwise, you could just request a custom itinerary of your own choosing. Use the form below to send an inquiry to Hovd Tour; tell them how many days you have, and what key places you'd like to visit, and they'll send you a quote and a detailed itinerary. -Get a bus ticket to Moron. Comfortable buses leave to UB every day. Journey is about 15 hours. It's a tolerable journey, and will save you compared to hiring a private car for the UB-Moron return journey. -Get in touch with Bata Byambadorj, a great guy who speaks good English and runs Bata's Guesthouse in Moron. Search for 'Bata's Guesthouse' on Facebook and let him know when you're arriving in Moron. -Bata will pick you up; you can stay at his guesthouse (leave quickly, Moron is not a nice town!) and organize a cheap tour to depart the next day. -Khatgal is about 3-4 hours north of Moron. Bata knows all the nomads who offer horses around Lake Khovsgol, and plenty of drivers if you want to do a vehicle tour, too. He's cheaper than the UB-based operators. 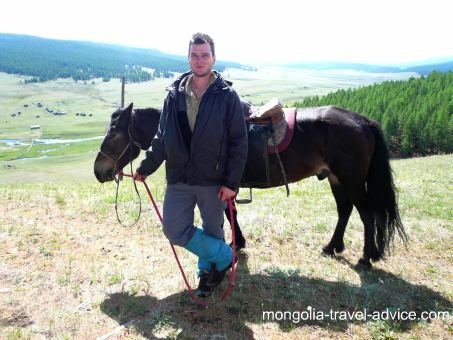 -Compared to Hovd Tour's more expansive offering (see above), you get what you pay for, and will need to arrange your own food, gear, cooking, logistics, etc., which is part and parcel of a no-frills tour in Mongolia. However, Bata's tours of Lake Hovsgol are the best choice for shoe-string travelers. Good luck!